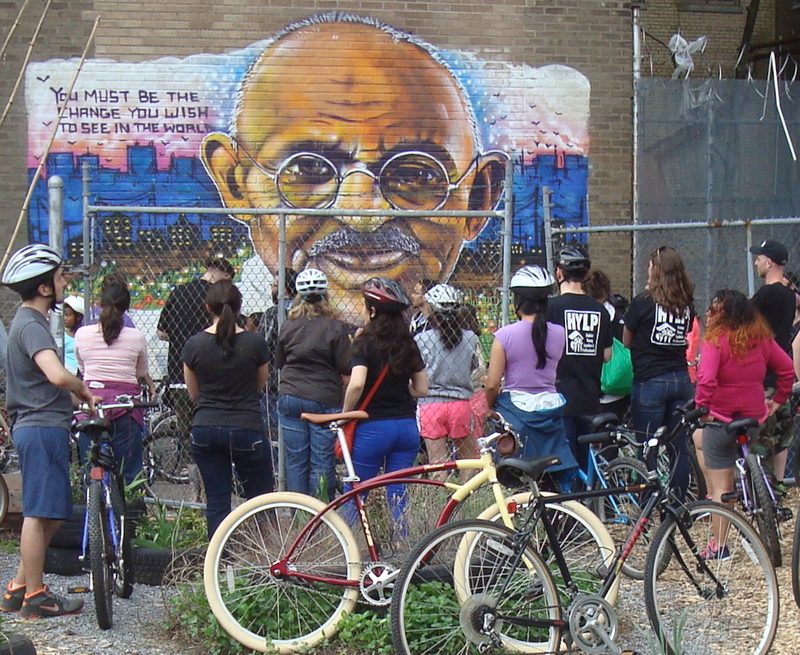 Riders inspect a mural of Mahatma Ghandi during the Trenton Social Ride. ‘Ghandi Garden’ is a project of the S.A.G.E. coalition, who are planning a mural at Princeton’s Paul Robeson Center. (click to expand). Princeton’s Paul Robeson Art Center, at Witherspoon and Paul Robeson Place, is planning a new art installation. This piece will be on the building itself- Princeton Arts Council have commissioned the S.A.G.E. Coalition, an arts collective based out of Trenton, to provide the work. The new mural will not be visible from the street, but is likely to be a striking feature for this who seek it out at the rear of the building. The piece will be representative of the ‘Underground Railroad‘, the community network which worked to assist African-Americans escaping slavery in the 19th century. Work by the artists in the past has included the popular ‘Ghandi Garden’ mural (see photo, top), at East Hanover Street in Trenton. The S.A.G.E. coalition, who will be responsible for the artwork, have designed installations in Trenton and Hopewell. It will be interesting to see how the mural contributes to Princeton’s street art scene. This entry was posted in Downtown Vibrancy, Princeton and tagged Princeton, street art. Bookmark the permalink.